We hold these truths to be self-evident, that all men are created equal, that they are endowed by theirCreator with certain unalienable Rights, that among these are Life, Liberty and the pursuit of Happiness.That to secure these rights, Governments are instituted among Men, deriving their just powers from theconsent of the governed, That whenever any Form of Government becomes destructive of these ends, it is the Right of the People to alter or to abolish it, and to institute new Government, laying its foundation on such principles and organizing its powers in such form, as to them shall seem most likely to effect their Safety and Happiness. Prudence, indeed, will dictate that Governments long established should not be changed for light and transient causes; and accordingly all experience hath shewn, that mankind are more disposed to suffer, while evils are sufferable, than to right themselves by abolishing the forms to which they are accustomed. But when a long train of abuses and usurpations, pursuing invariably the same Object evinces a design to reduce them under absolute Despotism, it is their right, it is their duty, to throw off such Government, and to provide new Guards for their future security. A bill of particulars documenting the king’s “repeated injuries and usurpations” of the Americans’ rights and liberties. Such has been the patient sufferance of these Colonies; and such is now the necessity which constrains them to alter their former Systems of Government. The history of the present King of Great Britain is a history of repeated injuries and usurpations, all having in direct object the establishment of an absolute Tyranny over these States. To prove this, let Facts be submitted to a candid world.He has refused his Assent to Laws, the most wholesome and necessary for the public good.He has forbidden his Governors to pass Laws of immediate and pressing importance, unless suspended in their operation till his Assent should be obtained; and when so suspended, he has utterly neglected to attend to them.He has refused to pass other Laws for the accommodation of large districts of people, unless those people would relinquish the right of Representation in the Legislature, a right inestimable to them and formidable to tyrants only. 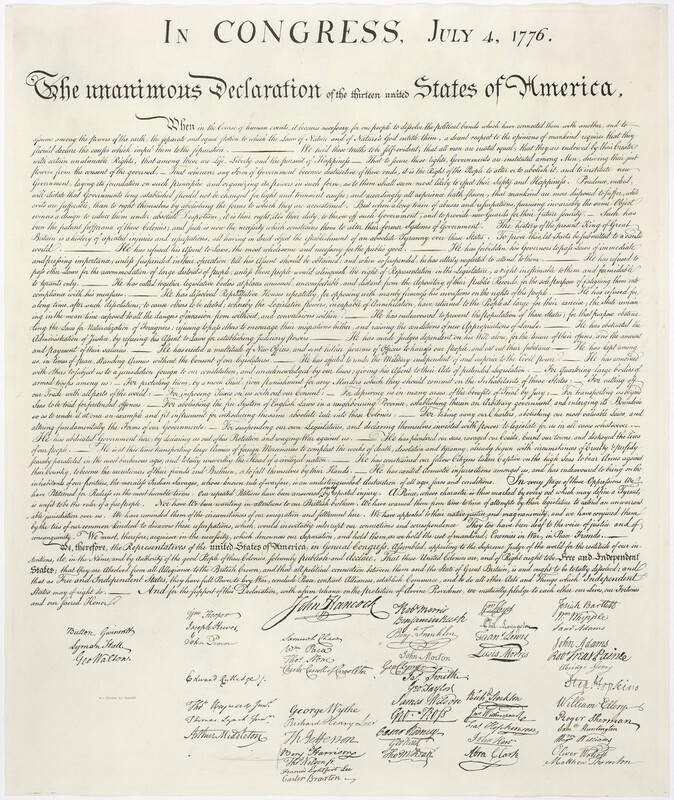 Below is a high resolution copy of the Declaration of Independence. Click for a larger view. When the image opens in a new window, you may need to click again or zoom for a closer look.